“I did not believe that working with the children in Room 4 was going to make any difference to them at all but the changes I have seen are very big! Now I believe it is worth the effort”‘ Quote from Maria, Head Nurse at Yelatma orphanage, Corpus 3. I became very emotional when Maria said these words to me as this is exactly what I imagined all the staff had felt when we first started the project with the Room 4 children. This was my 3rd trip out to Yelatma for ThePromise and it has by far been the most positive and rewarding of the 3. When Jo and I first came in December 2008 to assess the 14 children in the ‘end room’ or Room 4, we were shocked and deeply saddened by what we found. The children were so deprived of any stimulation or human contact that they simply sat or lay on the floor rocking, self harming or twirling endlessly around. When we walked into the room we were literally mobbed, the children hanging on us, pulling our clothes and hair until the angry carers ripped the children off us. These carers spent all their time guarding the door to room 4 to ensure that the children would not ‘escape’ out into the hall way and very few actually ever tried to make a bid for ‘freedom’. 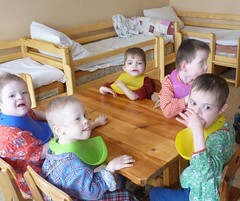 Jo and I recruited 2 play workers (funded by ThePromise) on the first trip called Sveta and Lena. We left them with instructions to take each child out of room 4 daily and ‘get to know them’. We spent time assessing each child and set up some simple guidelines for working with them. 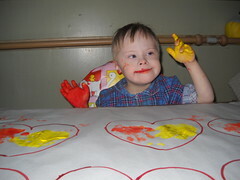 When we went out again in February 2009, we reassessed each child and set up some more formal therapy goals for them. We did some informal training with Sveta and Lena and they both really seemed to be enjoying what they were doing. It was apparent on this second trip that there were already some very noticeable changes in the children. Some of them were much more able to focus on the activities we were doing and the room seemed generally calmer. We also saw that some of the carers seemed to be engaging a little more with the children, though on the whole this was still an area of great concern. When we first met Nastya she seemed ‘wild’. She would scuttle over to you and begin to pull at your clothes, talking at you but not making any sense. When we first took her into the makeshift therapy room in the dining room, she went straight over to the suitcase I brought over filled with toys, pens, paper and other equipment. She began to frantically unpack the suitcase, throwing the toys out and randomly moving from one object to the next. She could not follow even simple instructions and became extremely distressed when she had to return to room 4. It was almost impossible to assess how much she understood and could communicate as she struggled to concentrate for any length of time. Nastya also spent a lot of time regurgitating her food over and over in an attempt to self stimulate and this was a distressing behaviour to observe as well as unpleasant to say the least. The changes in Nastya over the last 6 months are beyond even the highest expectations. Her play worker has taken her out of room 4 daily and worked with her tirelessly. The goals we set up for her included ensuring she has some sensory experiences daily and to encourage her to be able to attend to an activity for her to begin to focus on one activity at a time. The results are astonishing. 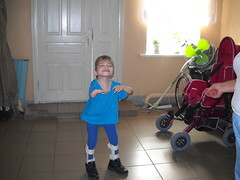 Nastya no longer ‘scuttles’ about at great speed but walks with purpose to where she is going. She looks at you with clear blue eyes when you talk, completely understanding simple instructions and questions. She can answer you with understandable speech and can make her own choices and needs known. 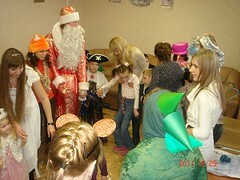 In all the time I spent with Nastya she did not regurgitate her food once. This form of self stimulation has stopped and that alone is wonderful for her! Nastya has emerged as one of the brightest children in room 4!! She is obsessed with making sure everything is in its place and will often hang up the washing that has fallen from the line or pack toys back into the box. She focuses on her activities and when I left I saw her sitting contentedly in a corner of the summer house paging through books and smiling happily. Andre came to the orphanage from another orphanage 2 years ago. I have been told that he could walk when he arrived. In fact his mother gave him up when he was 9 years old as he was hyperactive and she felt he was a danger to himself. When I first met Andre he was curled in a foetal position in bed. This is how he would be all day and night. He was fed in bed, changed in bed and was only taken out of bed for the weekly bath. I really felt that he had completely given up on life. He has contractures in both legs and hips due to being bed bound and can no longer move or walk. 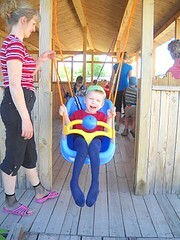 Lena, the play worker was set goals that included bringing him out of bed daily and ensuring he had some human contact. I have also strongly encouraged the carers to take him out of bed and let him eat with the group in the dining room or sit with them when they receive input from the play workers. If you were to meet Andre today, you would not find him curled up in bed anymore. He sits up waiting for someone to fetch him and take him to the others. He smiles and interacts with you and although he is still very sad he seems to be gaining some of the joy he has lost through his childhood. Andre used to self harm by hitting himself in the face or banging his head on the wall or bed. I did not see this behaviour once during this last visit. He has hope again. In general the feeling around Room 4 is changing. These changes are small and they are taking a long time in coming. But they are happening. I have seen the carers actually get up and fetch toys for the children. They have a table in the room with paper and crayons, they have a few board books to page through. Sadly, this is not consistent, it all depends on which carers are on duty, but when ThePromise play workers are there things pick up and the atmosphere changes. The children are let out of the room, they go for walks outside, they get to play a little. 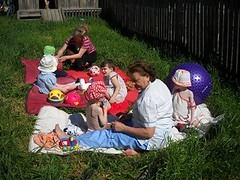 The carers have watched in amusement as we take the children out, work with them, play with them. They have seen the children do things they never thought possible and perhaps, just perhaps they will begin to understand that they have potential to learn! The project in Room 4 may be small compared to the Portage program but the impact for the individual children is huge! It has been worth the time, money and energy for each of the 14 children and I bet if they could thank all those that have made it possible they would do so with tears in their eyes!